2005 BMW R1200RT Sport Touring Motorcycle for Sale has a factory one piece low seat installed, a fully functioning electric windshield that blocks tons of air and can make a huge difference on those long rides. PLUS, the R1200 RT has Hyper Lites brakelights and just 75,533 Miles on it currently. The R 1200 handles great and is very, very clean. The BMW motorcycle company prides themselves on continually improving their product and '05 was the year that the 1200 RT replaced the 1150 RT. Eliminating 44 lbs and increasing power by 15% has made these one of the most sought after BMW. This bike has some miles on it but still rides like a bike that has as few as 10k on it. This would be a great bike for anyone that needs more storage room for the commute or for a rider that wants to do some touring on those thrilling switchbacks. There are a few chips in the paint from being on the road but other than that this bike is in excellent shape. If you have any questions regarding the used BMW motorcycle for sale in this ad or any of the parts and accessories in the list above you are welcome to contact me using the space below that has been provided by GoGoCycles Used BMW Motorcycles for Sale (and PLEASE do not neglect to include your contact information in your email or to provide a phone number or email address!) so that I can respond with answers to your questions. GoGoCycles would also encourage bikers to submit a review of the bike to make the biker community aware of any problems that are commonly associated with the 2005 R1200RT or to highlight its positive features and help potential buyers make informed decisions. 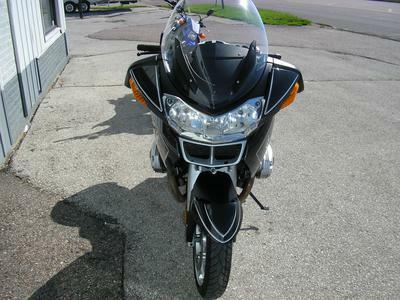 The 2005 BMW R1200RT for sale is located in Sioux City, IA 51105. If you're interested please e-mail and don't forget to mention that you found this ad on GoGoCycle's Used Motorcycles and Parts for Sale www.gogocycles.com using the comments form located below this ad.